Chair. Cellar. My body is dead. Stilly glove puppet - soft body, mute head. Blood's turning black, covering dress. People and trusting - damnable stress. Last night I looked up and matched each star with a reason why I love you; I was doing great, until I ran out of stars. You are that missing part of me for which I have. Will the girls get back together? Or will Ramsey continue to flirt with Fleur? Thank you MrChillie for this cute picture! "A Role Of Another Person"
Morgan is an actor, he also loves to change clothes and parody different celebrities or characters. He can create designer things, sew, knit, also understands make-up. He’s a self-confident sly fox, who had many girls, but his heart preferred a cute wretch with whom they live together. Katsumi is a lunatic girl, who can fall asleep anytime and anywhere because of her narcolepsy illness. Lunatic Katsumi Shimada turns into an experienced leader of a Japanese mafia gang; she can handle a samurai sword and has ninja skills. And the real Katsumi lives in a quiet harbor, brewing tea and doing massage with scented candles. Annabelle successfully worked in a puppet theater as a ventriloquist until a herd of girls joined her with their beautiful and expensive puppets. Soon the best roles and costumes were given to toys and their owners. Mr. Scar came up with an evil plan for revenge! The criminal duet escaped, leaving behind the ruined puppet theater and bodies of other people's toys. She is a puppet in his hands, but together they are strong! 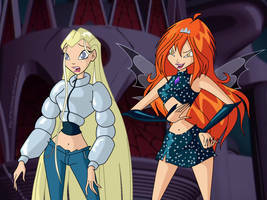 I'm gonna see if I can get Pennsatucky and Bloom-Tazza93 to enter since those two are Winx fans. Thanks for the on .